The Moravek range of BC Inline Automatic Beer Carbonators and m+f KEG-Technik Kegging systems have combined their technical co-operation to offer the breweries a new concept KEG packaging that delivers consistent high final product quality as well as a reliable unit. The Moravek BC Beer Carbonator is specifically designed to automatically inline carbonate beer and can be used to carbonate other products such cider, hard cider, sparkling wines, soft drinks and mineral water in the CO2 content range of 2 to 8g/litre (1 to 4 volumes) CO2 content. In conjunction with m+f KEG-Technik KEG filling the KEG bloc can also be used to nitrogenate stouts, porters and nitro KEG style ales. Smooth natural carbonated finish product taste and mouth feel – smaller CO2 bubbles that result from efficient gas atomise carbonation gives beer, cider or wines a smooth natural carbonated finish. 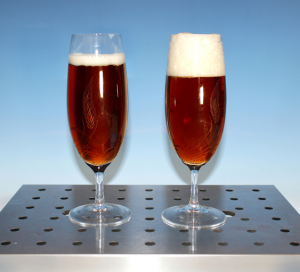 Greater head retention after pouring from KEG Kegged beer from the same brew batch – glass on the right with Moravek’s BC gas atomise beer carbonation – glass on the left without. 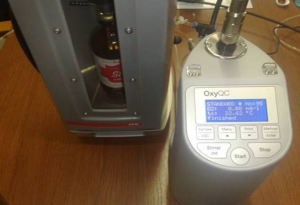 Consistent carbonation levels – set temperature and carbonating pressure ensure consistent carbonation levels are maintained at all times and product cannot be over carbonated. By Boyles laws of physics; a set temperature and pressure achieves a set product saturation point which makes over carbonation impossible with the BC system. 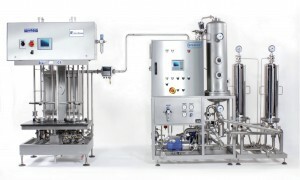 Improved filler performance – The Moravek carbonator delivers stable efficiently carbonated product to the counter pressure m+f KEG filler resulting in efficient performance. The BC unit can take CIP solutions from the breweries central CIP system or Moravek can provide a dedicated CIP set for packaging. On the BC control panel you can select a number of CIP programmes which will then automatically control and monitor the cleaning process of the complete carbonating, (filtration) and KEG-filler to achieve repeatable sanitisation of the system, time after time. An important feature when handling beer. 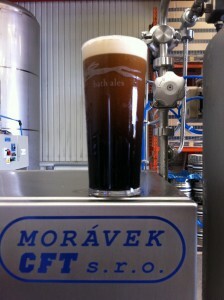 Dark stout nitrogenated for kegging on Moravek BC Beer Carbonator System and an m+f KEGTechnik filler, type MICROMAT M 2/2-b.